Final version of floor plan as built. 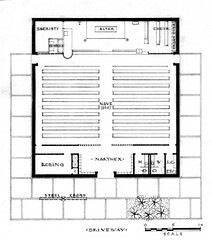 Floor plan of final version of church as built. The front entry has been reduced to a bare minimum with the steel cross to the left of the entry and a planting bed to it's right.